The EN Certified Septic Tank has a 3,800 litre (840 Gallons) capacity complete with ¾ – ¼ split Baffle Wall. It is a Double Chamber Tank and its capacity is suitable for 8 people. Following rigorous testing at the Institute for Wastewater Technology (PIA Gmbh) in Germany, McGraths Precast Concrete Ltd has been awardedIreland’s first CEN Certificate for a Precast concrete septic tank in accordance with EN 12566-1. Why is CEN Certification important? 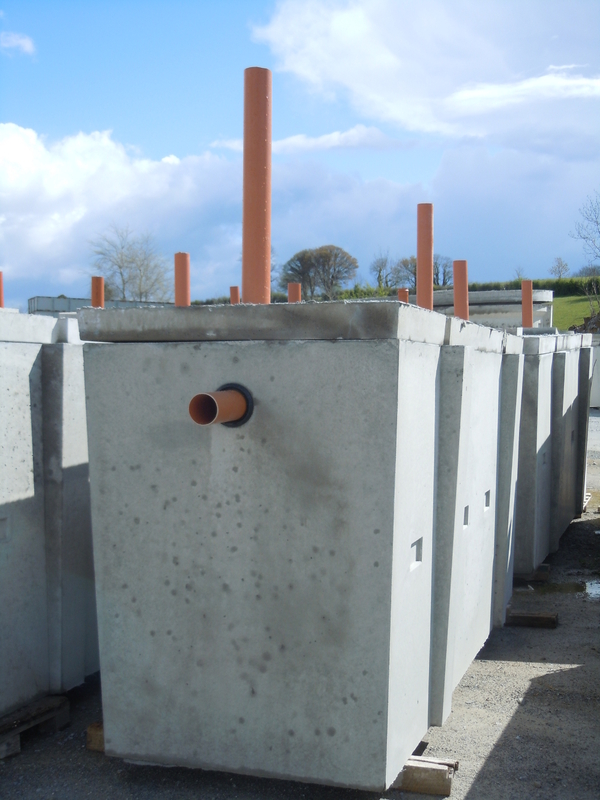 Local Authorities in Irelandwill be adopting EN 12566-1 (Small Wastewater Treatment Systems for up to 50PT–Part1: Prefabricated Septic Tanks) as the minimum requirement for a new septic tank from 1st of May 2012. Choosing a system with this certification will now be a critical part of your planning application. The CEN standard, also adopted by the NSAI, specifies a range of requirements and test methods in relation to septic tank design and performance; specifically water-tightness, capacity, hydraulic efficiency and structural behaviour, and acts as a benchmark for systems throughout Ireland and across Europe. Call us and future proof your old septic tank today! Dig a deep hole with a solid foundation – concrete or fine gravel base. The Septic Tank is to be placed so that the inlet is at the correct depth to be connected to the drain. Tank may be backfilled once in position, with most available materials. Care should be taken so that the tank is not damaged during backfilling, for instance by boulders or other large objects.